[Update: Looking for more parking policy information? Is $400 per month for season parking outrageous or reasonable? Well, it depends ... But what does it depend on? One suggestion: the price of a hamburger! This rule-of-thumb for hourly parking prices comes from Pete Goldin at the Parking World blog yesterday, citing Dr Adhiraj Joglekar, founder of the website driving-india.blogspot.com. Hmmm. I guess they are alluding, tongue-in-cheek, to the Big Mac Index from the Economist. This index uses burger prices to correct for differences in the purchasing power of money in different countries. But seriously, what is the right comparison? Purchasing power is obviously not the only issue here, since parking prices usually vary from place to place within every city. Prices range from zero in many suburban parking lots to 'expensive' in the city centre. But the last time I looked burgers were not free-of-charge in the suburbs. How about comparing parking prices with property prices? After all, parking is a use of real estate, right? Space that is not used for parking could be used for some other real-estate use. India’s National Urban Transport Policy says explicitly that public parking prices should take account of land prices (although it doesn't say how to make this happen). So, as part of the Asian cities parking study, I compared city-centre parking prices with office rents. This was helped by nice data from Colliers International on both CBD parking prices and Grade-A office rents for many cities around the world. The graph below is the result, using their 2009 data. The contrasts are striking (even allowing for possible inaccuracies in the data and other quibbles). 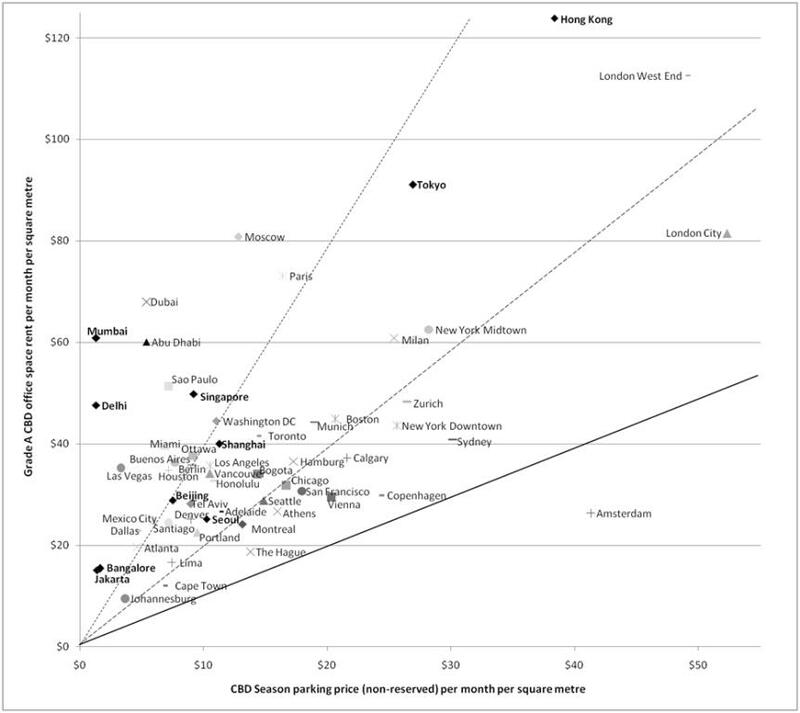 We have cities near the diagonal line where CBD parking prices per square metre are comparable with Grade A office rents. Amsterdam and Copenhagen are prominent along with London City, Vienna, The Hague and Sydney. At the other extreme, Delhi and Mumbai in the upper left part of the graph have expensive office space but extremely cheap parking. So much for having parking prices take account of land prices. Jakarta and Bangalore at the bottom left have cheap parking and cheap office space. I was a little surprised by Singapore's rather cheap CBD parking relative to its CBD office rentals. However, since 2003 the parking requirements were lowered drastically. So the CBD parking supply per worker is gradually decreasing now, which should push parking prices up. Hong Kong and Tokyo are also intriguing. Their CBD parking prices are among the highest in the world. But from the perspective offered by this graph, such parking prices are not surprising given their expensive CBD real-estate generally. What do you think? Are real-estate prices (rents) a useful comparison for parking prices? Can data like this provide any policy guidance? In the graph both CBD parking prices and CBD Grade A office rents are shown on a rent per square metre basis. To convert parking prices per space per month to parking prices per square metre per month I used 19.5 sq. m. as a very rough estimate of the space required for a parking space, including aisles, etc. So $10 per sq.m. per month is about $195 per parking space per month. Fascinating graph! Given that the two axes are on different scales, only Amsterdam prices its parking above land prices - no wonder they all cycle! Though Bangalore and Jakarta have low land and parking prices, parking is still about 1/8th the price of land. And our commercial and political capitals (Mumbai/Delhi) are disgraceful. The ratio is probably the same in Pune (about 8 nominal $/sqm/month for office space and 1 nominal $/sqm/month for parking). Incidentally, even the "high parking price" places of Tokyo and Hong Kong seem to charge only about 1/3rd the land cost for parking. Thanks for the comment Ashok. Yes, the Indian cities really stand out as an extreme case of cheap parking! Just a quick clarification: the vertical axis is not exactly "land cost" (although it probably correlates with land price). It is office floor area rent. 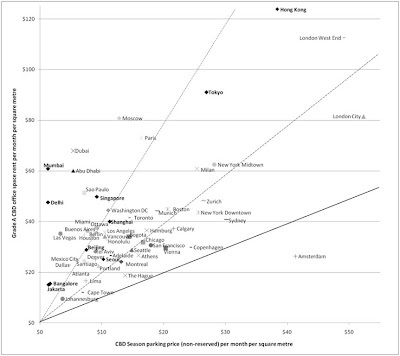 Still a relevant comparison since in many of these cities parking is mostly in structures or underground. The results for Delhi are interesting and got me thinking that real estate prices might work for parking in a 'rational' marketplace but not where the land market is severely tampered with. A cursory read of Rana Dasgupta about the Delhi Development Authority (DDA), the authority responsible for releasing land for development in the city, explains the point. According to Dasgupta the DDA withholds land on purpose to extract a scarcity rent. For this reason the post of middle ranking engineer in the authority has been THE most coveted post to acquire. The engineer can literally make a killing as it is he (normally 'he') who grants planning permission. Such a constraining of the land market in Delhi has led to the explosion of real estate in outlying areas, Gurgaon, Faridadbad, Dwarka and Ghaziabad where developers went from house to house negotiating complicated purchases with farmers and villagers. The relevant point for parking I'm guessing is that while land is held vacant, facing development prohibition as it is in the case of Delhi, its present ACTUAL value is extremely low. In this scenario parking lots can be provided at very low prices as they require no capital input, only the very cheap labour of attendants. Am I completely barking up the wrong tree here? What about the oft quoted "price it until 15% of the spots are vacant", a la Shoup? Interesting article in the Times of India today which might throw light on the low price of public parking quoted in your research. A litigant had taken a case to the High Court complaining of being charged Rs. 700 for parking his car at New Delhi Railway Station even though the advertised prices were Rs. 10 for 12 hours. The Municipal Corporation of Delhi and the Delhi Development Authority both confirmed to the court that the price was and is Rs. 10 for 12 hours. It seems that the official subsidized price of parking, one factor encouraging MV use for commuting, is now saturating supply in more locations, creating a black market which the parking contractors keenly exploit. The Rs. 10 figure is becoming an anachronism like the price of bread in the Soviet Union - shortages here, black market there, a mess. I'd love to see this data set expanded and used as a benchmark for whether a town is out-of-the-mainstream in subsidizing parking.